What’s Wrong with Wisconsin’s School Financing? protected certain district types against declining student outcomes due to poverty and truancy have disappeared. Specifically, the effects of poverty and truancy have become too strong to be overcome by the previous resiliency of rural and suburban districts. Learn more about your school district’s funding disparities. The final report of the Blue Ribbon Commission on School Funding was released Jan. 7 by co-chairs Rep. Joel Kitchens (R-Sturgeon Bay) and Sen. Luther Olsen (R-Ripon). The AEF Steering Committee will be reviewing the report to determine how the recommendations align with the goals of AEF. On January 2, 2019, Wisconsin Public Radio reported that Governor Evers will include in his budget proposal that the amount that taxpayers pay for voucher schools to be printed on their tax bills. AEF support this position since vouchers redirect much needed funds for public schools to private institutions. The Assembly Republicans and Governor Walker have released plans that call for additional support for our PK-12 public school systems in the next biennial budget. Members of the Wisconsin Association of Equity in Funding (WAEF) applaud the change in direction from past budget decisions that included significant funding cuts and minimal increases (far below the cost of inflation) for PK-12 public schools. 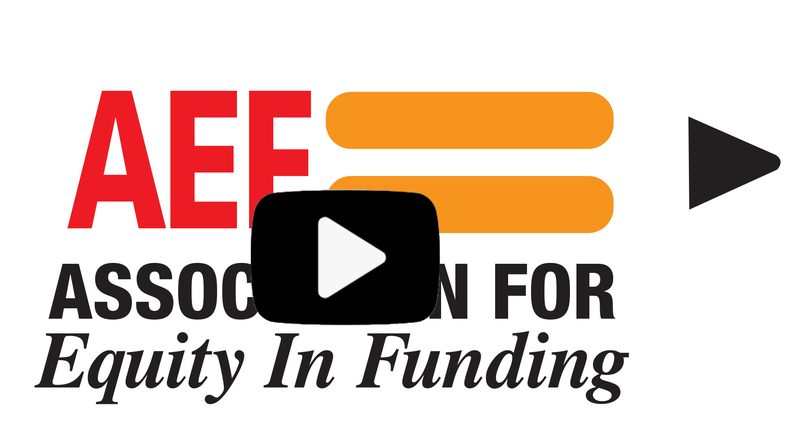 WAEF members believe our lawmakers have heard the voice of the citizens of the state and have agreed that PK-12 public schools need additional funding support from Madison. We strongly endorse the Governor’s proposal to increase per student categorical funding of $200 per student in the first year and an additional increase of $204 in the second year. We encourage Governor Walker to continue to advocate for this increase and secure these funds in the final budget. WAEF has reviewed the Assembly Republicans proposed PK-12 education funding plan, and support the effort to create greater equity by allowing low spending districts the authority to increase their revenue limit to $9,800 per student. While the increased low spending revenue cap authority is a great move to help school districts, we are concerned that this increased revenue is a shift to property owners and in many property poor school districts this would be a significant burden through large increases in the mill rates. WAEF proposes for consideration that the Governor and legislators consider supporting a plan that would achieve the $200 and $204 increases as well as the Assembly Republican’s plan to increase the low spending revenue cap floor at $9,800 per student. Both plans could be accomplished by shifting a portion of the property tax levy credit to the school districts that are the lowest spending districts in the state. This shift could be easily done. Both the Governor’s and the Assembly Republicans’ proposals call for increase in funding the property tax levy credit. If the Governor and the Legislature are truly committed to property tax relief, they should provide that relief to the school districts that need it the most. The property tax levy credit is the mechanism that would accomplish all the goals of the Governor as well as those in the recently released proposal of the Republican Assembly. The Wisconsin Association for Equity in Funding (WAEF) is pleased to announce that Mr. Pete Ross will be joining the WAEF as its executive director. Mr. Ross has been a longtime advocate of school funding reform that balances the educational needs of each school district with responsible tax policy. He has served children in public schools as a teacher, administrator and superintendent. In each position, Mr. Ross has been a staunch supporter of public schools and believes deeply that our democracy is strengthened by a vibrant public school system. Mr. Ross looks forward to establishing connections between members, promoting the work of the Steering Committee, helping to build membership and supporting the needs of members as those needs relate to equitable opportunities for children and equal treatment of taxpayers. While school funding has reached crisis levels for many Wisconsin school districts, Tuesday’s referendum results show that people care deeply about investing in their community schools. Yet due to a broken school funding system, educational opportunities for many children today are even more dependent on where they live, and their financial status. The Wisconsin State Constitution and State Supreme Court call for us to provide a “sound, basic education” in “as nearly uniform as practicable” public schools for every child. Despite this, throughout Wisconsin, community school districts are faced with relying on local referendum to meet the basic needs of our students. On Tuesday night, nearly 70 referendum statewide sought to fill a $1.3 billion hole in our state’s public education investment. In a resounding affirmation of Wisconsin’s community schools, all but twelve passed. The results, however, are also a resounding vote of no confidence in our broken school funding system. For every school district passing a referendum, there are many more who cannot financially afford or politically attempt to pass a referendum. 1. Greater funding inequity saw DPI School District Report Card scores drop significantly. 2. Greater funding inequity saw the benchmark 8th grade math scores drop significantly. In many districts, we found that adequate funding is actually the difference between proficiency and non-proficiency in math. Through our research, we have found that the school funding system in Wisconsin has created funding disparity in the majority of school districts for over a decade. The need for school districts to rely on record level referendum just to meet basic needs, is further evidence of these inequities and contribute to our systemic education problems. The AEF will continue to work with its statewide partners and present research-based evidence to ensure that all children are empowered through public education no matter where they live, no matter what their circumstances, and that Wisconsin taxpayers are treated fairly. View the news conference regarding AEF’s latest study. In 2015, the Association for Equity in Funding (AEF) commissioned a second study through the Forward Institute to continue examining the systemic effects of school funding in Wisconsin. The first study, released in 2014, concluded that the current school funding mechanism in Wisconsin is insufficient to ensure that every child in every school has the resources necessary to receive a “sound, basic education” as defined in Vincent v. Voigt (Wisconsin State Supreme Court 2000). Further, the systemic effects over time are creating resource deficits due to increasing rates of higher needs students which are reaching crisis levels. In order to effectively measure disparity in funding between school districts with vastly different student demographics, the first study developed a “Funding Disparity Rank” for each school district in Wisconsin. This ranking was generated by combining school funding and spending capacity, adjusts for inflation over the 10 years of the study; then uses a formula to “equalize” districts based on high needs student rates (as defined in Vincent v. Voigt). The “Funding Disparity Rank” provides for an apples-to-apples comparison of school district funding and spending capacity. What remained unclear after the first study, is whether the school funding model and resulting disparity as measured by the “Funding Disparity Rank” has a direct impact on student performance and outcome? This new study sought to answer that question. This study finally addresses the “adequacy” of funding question by testing whether funding disparity and other factors known to negatively affect outcome (i.e., student poverty and truancy) have a positive or negative association with key measures of student outcome. In the important benchmark of 8th Grade Math scores, funding disparity was found to have a significant negative effect. School districts with higher funding disparity, as measured by our previously discussed index, saw lower test scores. This is further evidence that the Wisconsin school funding system itself is creating segregation of opportunity. The results of this study demonstrate that the system funding the education of our children in Wisconsin actually contributes to inequity of educational opportunity. The quality of educational opportunity in Wisconsin now largely depends on where you live, and the relative affluence of your family and community. Further, the systemic problems indicated by this study require immediate solutions to address systemic issues of student poverty, truancy, and increasing inequity in school funding. On Wednesday, September 14, 2016 at 2:00 p.m., State Representative Melissa Sargent (D-Madison) and State Senator Kathleen Vinehout (D-Alma) will host a public press conference in the Assembly Parlor. The Association for Equity in Funding will release a new study, “Wisconsin School Funding and Student Outcome: Systemic Roadblock to Opportunity.” The study has important implications for Wisconsin schools and the communities they serve. The study is embargoed until September 14th, 12:00 p.m. (noon); however, media may contact the following with any inquires prior. The Association for Equity in Funding (AEF) is a group of Wisconsin school districts that seeks financial equity in the state system of school financing. The members include larger and urban-type districts such as Green Bay, Chippewa Falls, and Beloit, as well as smaller, more rural districts like Algoma, Antigo, Cornell, Spencer, Southern Door and Whitehall.